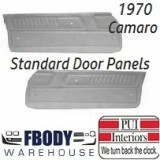 This is a set of brand new deluxe die cast inner door handles for 1970-1974 Camaro, Trans Am, and Firebird. Includes the inner trim piece in black. 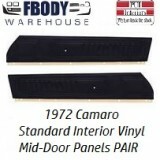 This is a set of brand new deluxe die cast inner door handles for 1970-1974 Camaro Trans Am and Firebird. 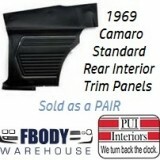 Includes the inner trim piece in black. 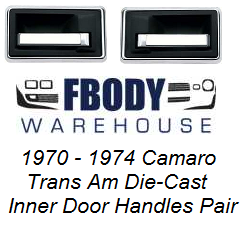 Replace your pitted and broken door handles with a brand new set from Fbodywarehouse to make your interior look new again.